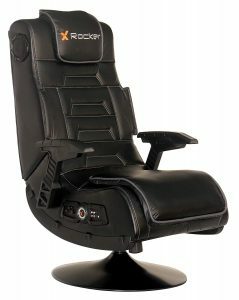 X Rocker 51396 Pro Series 2.1 Pedestal is a very modern and comfortable video gaming chair with an ergonomic design, wireless Bluetooth, and an awesome sound system for a gaming chair. 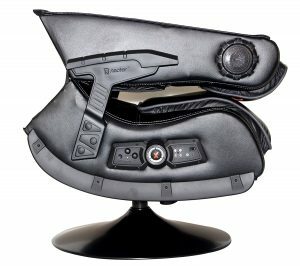 You can connect it with several chairs for the best gaming. This ergonomic and comfortable chair has a pedestal that swivels and tilts and gunstock arms. So you can listen to your songs, watch movies, read, play games or simply relax on this comfortable chair. The integrated wireless transmitter works with any device with RCA stereo outputs. And you will get the RCA cables included in the box. With the great interactive audio system you will actually feel the music, not just hear it, thanks to the two speakers hidden in the headrest and even a subwoofer with the Audio Force Modulation Technology by Ace Bayou that magnifies the sound quality. It is compatible with a PS4 and Xbox One as long as your TV has the right components as you’ll be hooking up this chair to your TV. The power source for this X Rocker Chair is an AC plug into the wall. And you plug the small device into the audio output on your TV for wireless transmission. The chair is plugged into an outlet and to an auxiliary out on your TV and can be used with any system. There is a headphone out jack, but nothing integrated to hold your headphones when you’re not using them. You can use it with headsets with the headphone and microphone jacks. The speakers behind your seat feels much better than having them in front of you. With the way these speakers are located you’ll get a surround sound feel and it gets really loud at the maximum volume. This great modern and ergonomic chair weighs 57 pounds and is 42 inches high at the rear including the headrest, the front is 8 inches off the ground. It is a very comfortable chair with plenty of support and user-friendly features. You’ll feel very comfy on this chair even if you’re short or tall, small or big size it will hold your frame and you will feel secure. It is great that it swivels to the left and right and tilts very smoothly. Please note that this is not like an office chair that will move around on wheels but fixed in the same spot. As this is more like a squat chair you can not adjust the height, which is fixed too and your legs will not point down but forward. You can lean back without any problems. If you feel that there is smell coming out of the chair you can keep it out in the open for a few days and use fabric air odor sprays. Arms will stay in place and fixed and they won’t move if they are attached properly. It has the adjustable vibration feature- vibrates and you can control the intensity easily. One of the customers commented on the delays in the response time of customer support but that seems to have changed over time. You’ll get a warranty of 90 days from the day of your purchase, which is OK for a chair. You’ll find that overall it is worth the money.